IMPORTANT: This is a group training run and NOT a race, as described below. The 17km course will be Drysdale to Queenscliff only. 34km remains Queenscliff to Drysdale & return. It is possible to register at Drysdale for those doing the 17km (but see the below registration section if taking the train). Run numbers will be issued at Registration for those who have not collected them before the day. 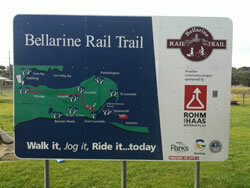 The 16th Bellarine Rail Trail Run (17 or 34kms) will be held on Sunday August 18, 2019 as an out & back course from Queenscliff to Drysdale Railway Station & return (34km) or one-way Drysdale to Queenscliff (17km) along the BRT. The trail is tremendously scenic and ideal for running being wide, well marked and all on smooth, unsealed paths aside from the 4.5kms at the Queenscliff end (sealed). More information on the BRT can be found here. 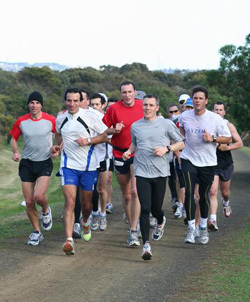 It is an ideal training run for the Melbourne Marathon events. The course is relatively traffic free, but you do have to cross some major roads & the railway line, so please take care. 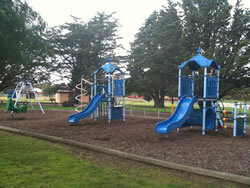 The trail is also open to the general public and it is important that their use is not affected by the event. For this reason, this is NOT A RACE - there are no prizes for finishing first! Standard: $10 (June 1- Aug 11) regardless of distance chosen. Late: $20 (Aug 12 - Aug 17, 5pm). No on the day entries! NB: This event was free for 11 years but costs for putting on the event have risen and there is now a need to outsource some of the logisitics including the entry system. The entry fee has been kept to a minimum and any excess funds will go to Geelong Athletics. The entry process has been outsourced to Register Now who come highly recommended by other event organisers. Check out the Travel Guide. 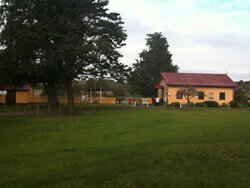 Queenscliff Railway Station: from 7.30am for either 17 or 34km runners. 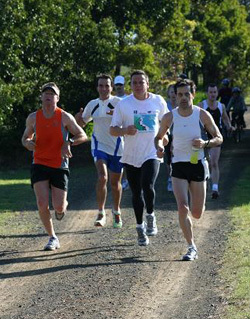 Drysdale Railway Station: from approx 8.50am for 17km runners. NB: For those running the 17km we recommend parking & registering at Queenscliff and enjoying a train ride to the start! Try to avoid registering at Drysdale if taking the train as you may miss the start as below! Food / Drink for the Aid Stations can be dropped off at either Queenscliff or Drysdale Registration. 9.40am (approx) - 17km Drysdale start. We will aim to start 5-10min after the train arrives at Drysdale so be ready to run as you get off the train & please register at Queenscliff if you're taking the train or you might miss the start! Check out the train section for those approx departure & arrival times. ▪ Bellarine Railway - The train for the BRT is the perfect way to have a trip on the Bellarine Railway. Alternatively, the regular steam train service departs Sundays from the Queenscliff Railway Station at 11am. Check their website for full details, fares and times. ▪ Queenscliff itself is a beautiful town with many varied shops & cafes. There is also the new multimillion dollar Queenscliff Harbour redevelopment with shops & observation tower. Why not have a weekend away in Queenscliff?? ▪ Queenscliff to Sorrento Ferry makes for easy access from the Mornington Peninsula..
▪ There is a children's playground & plenty of room for the kids to run around (see pics below). Please contact Brett Coleman for further information via email or call 0438 434 260.